Stone Shack at Ely Park rebuilt in September 2014 by the City Parks Department. 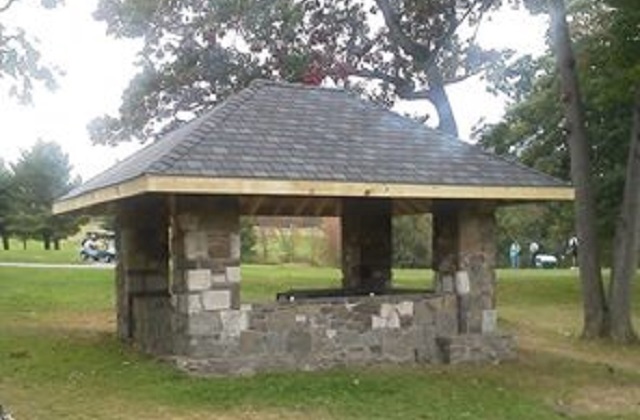 Any of you Binghamtonians remember the stone shack at Ely Park Golf Course? We in the Parks Dept.finished rebuilding the roof structure about 2 weeks ago. Put it back the way it was built. Tongue and groove decking,each support beam was removed and copied and replaced one at a time. I was the 1st to put my initials on it. Lots of room for more initials! There were 3. One between 16 green and 12 tee,one by 5 and one by the old dam hole before they put the dam in. Editor’s Note: This one is left of current 5 Tee and right of 18 Fairway. Did you know some of the holes up at Ely Park had as many as six different numbers from earlier course routings. In fact seven holes were called six different numbers and the average different hole numbers for the current 18 holes at Ely Park is nearly five! CLICK here to learn more and share more if you have a better memory or an old scorecard that is different than any of these routings!